Ever the clear-eyed realist, Lenin knew what the Revolution had failed to achieve. And this knowledge tormented him in the last weeks of his life. 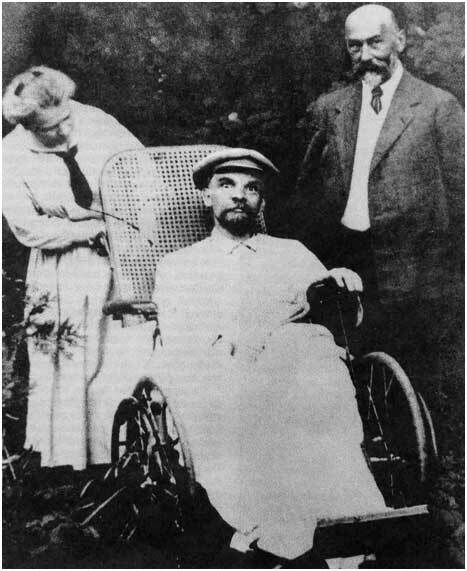 There is a photograph of Lenin in a wheelchair, from sometime in the summer of 1923, in which he is flanked on one side by his sister Anna and, on the other, by a doctor attending on him. Lenin had suffered his third stroke a couple of months before this, a blow that left him a hopeless cripple. He had lost his speech completely, also the use of the right side of his body, so that he coudn’t even hobble around on crutches. His eyes fix the viewer in a piercing, but frozen stare. Was the leader of the October Revolution, an astringent realist with one of the sharpest minds in the history of humankind, terrified of death, of his own death? That haunting stare compels us to try and find out. The succession of Lenin’s sclerotic attacks was rapid, relentless, though he had been suffering some of the disease’s symptoms for months previously. The first attack hit him in May, 1922, when he had just turned 52; the second struck on 15th December the same year; and the third, which completely devastated his body and did so permanently, hit home around the middle of March, 1923. In a mere 10 months, Vladimir Lenin, the architect of the first workers’ state in the world who had time and again displayed an astonishing ability to bounce back from humongous setbacks, had been rendered a shambling wreck of a man. The two bullets that a would-be assassin had pumped into him in August, 1918, which had stayed put defying all medical interventions, continued to do their own damage to Lenin’s battered body. He knew his end was near. But hadn’t he always bargained for an uncertain end to his life when he chose to enter upon the life of a revolutionary under a brutally repressive regime? Wasn’t he the one who used to tell his comrades that it was best that a revolutionary died early, because at fifty, he was a spent force? Wouldn’t it then be absurd to imagine that, at that point, Lenin could obsess with anything other than the future of the Revolution that he more than any other individual had helped make, and about whose future he had lately started having serious misgivings? Lenin was a deeply worried man at this stage, because he could not help feeling that the Russian Revolution was perhaps confronted by potential disaster, maybe even disintegration. It was a feeling that had been growing on him for some months now, at least since a little before his first stroke. Opening the Party’s political resolution at the 11th Congress of the Communist Party (March-April, 1922), Lenin had talked about a sensation that he sometimes had of being in the driver’s seat of a vehicle which he could not steer in the direction he wanted to, try however hard he might. He returned to the same theme a few more times in course of the Congress. It was a curious statement to have come out of a man who seemed to be supremely confident of his mission, a man whose iron will even his enemies admired, however grudgingly. In the face of stiff opposition from large sections of the Bolshevik leadership, Lenin had piloted the New Economic Policy (NEP) just about a year earlier, in March of 1921, after the Kronstadt uprising had deeply scarred the Revolution’s conscience. He had firmly believed that the NEP was the answer to many of the fledgling state’s problems at that stage, after the Civil War, famine, foreign invasion and epidemics had worked havoc on Russia. And the NEP did seem to be working in the initial months. The economy, prostrate and collapsed through years of chaos and dislocation, was recovering slowly. Industrial production was getting back to its feet, peasant unrest had eased after compulsory requisitioning of grain had been discontinued, and shortages of food and other necessities seemed at last to have plateaued out. Politically, the Bolsheviks could now be said to have wrested control over most of Russia from the White Armies, Tsarists and other counter-revolutionaries. The worst looked to have been got over with. What, then, could account for Lenin’s strange disquiet, his sense of loss of direction? As a Marxist, Lenin’s was the dream of human freedom, of a classless, stateless community of human beings living a life free from want, and in brotherhood with other men. In his classic State and Revolution, he had etched the picture of a post-revolutionary, transitional society that would pave the way to the realisation of this dream – a kind of para-state of ‘people in arms’ standing guard over the gains of the revolution, but otherwise a quite open, light structure free from the trappings of an oppressive state. Most importantly, the transition was to bring the least pain to the vast majority of the people. Things worked out very, very differently, however. Mired in economic, social and cultural backwardness, Russian society had traditionally been the classical antithesis to a potentially revolutionary community, and it was only an extraordinary combination of explosive ingredients in 1917 that had lit the fuse under old Russia. War, invasion, hunger, famine and the disastrous Civil War – coupled with the vast peasantry’s deep distrust of socialist practice – plunged post-October Russia in utter chaos. Ruin stared her in the face. Only a super-human effort of the collective Bolshevik will brought her back from the brink, but the price paid for the rescue was staggering. Democracy gave way to a ‘dictatorship of the proletariat’ which, in turn, led to a dictatorship of the Party, and for all practical purposes, to a dictatorship of the Party apparatus. A formidable standing army and an awe-inspiring political police (the Cheka) came into being so as to protect a country hemmed in on all sides by hostile forces. All freedoms had to be curtailed, many even to be dispensed with, for the time being at least. The para-state had transmuted into a super-state with limitless power over its citizens’ lives. Through Russia’s most difficult years – from 1917 through 1921 – Lenin drove these changes to the original Bolshevik schema relentlessly, often with something approaching equanimity. He was convinced that he had to retreat from his principles for the sake of preserving the Revolution, and he had no qualms about the retreat, hoping as he did that these were not irreversible changes. His belief in what the Party was ultimately pledged to achieve was pretty much unshakeable. And this belief gave him the moral strength to press on, regardless. Slowly but steadily, however, his belief was being undermined by a series of new developments. On the one hand, Lenin’s eyes and ears were opening up to a reality that was more nuanced, streaked with shades of grey, black and murky red. Russian society, Lenin came to understand more clearly now, was essentially far more backward-looking than he and his closest comrades had imagined: it was a pathetic, almost a pathological, kind of backwardness that had eaten into the ordinary Russian’s soul over centuries of repression, illiteracy, hunger and neglect. Stupidity, mindless adoration of authority, and crass selfishness were all part of the average Russian psyche. All this was not going away in a hurry. Having lived most of their adult lives in exile or in western Europe (where a measure of political democracy did exist, unlike in Russia) as fugitives from Tsarist repression, many of the first-generation Bolsheviks were near-aliens in their homeland in a very real sense. The battle they had on their hands was, therefore, far more complex than they had hoped it would be. For Lenin, it was a deeply distressing realisation. The evils of this backwardness were most apparent in the Russian’s penchant for bureaucratic red-tapism. Immediately after the Revolution, the Tsarist bureaucracy had withdrawn from sight – but only for a while. Inevitably, since the machine of the state had to grind on in even the most difficult times, significant sections of the same bureaucracy came back to claim their positions of power. The fact that the Revolution had little reserve resources of educated personnel only served to help this deeply-entrenched old-world bureaucracy’s cause. Arrogance, privilege and all manner of rent-seeking were rampant inside the bureaucracy’s domain, and these vices soon came back to plague the new state system with a vengeance. In a very real sense, then, the Tsar was dead but Tsarism was alive and well. Most disturbingly, even the new entrants to the ranks of the bureaucracy – drawn as they were from the hitherto-marginalised segment of society – succumbed to the eternal charms of this most depraved social ‘class’. Indeed, the bureaucracy began to emerge as the most powerful social stratum in the new Soviet society. Its contagion spread everywhere, and even functionaries of Lenin’s own party were often not immune to this contagion. As deeply troubling this realisation was for him, Lenin felt even more disturbed by puzzling character traits in some of his senior comrades that could only be ascribed to Russia’s essential cultural backwardness. Some of these leaders had proved their mettle through years of sustained underground political activity and had even been imprisoned or exiled. Their loyalty to the Bolshevik cause was beyond question, too. Yet, when these same men were installed in positions of power, they often showed themselves in very poor light. Arrogance of power, unbridled personal ambition and a predilection for low intrigue were, Lenin had always imagined, beyond the pale for Communists, and he was disgusted when such attributes surfaced in some of his colleagues. Joseph Stalin was one such leader. Stalin had worked his way up through the Bolshevik Party’s ranks by virtue of his diligence and his capacity for hard work. By and by, however, the dark side of his personality increasingly came to the fore and he began to consolidate his personal power in the organisation by manoeuvring and manipulation. The 11th Party Congress of March-April, 1922 – Lenin’s last Congress – elected Stalin to the position of the Secretary-General. Now Stalin wielded virtually limitless power over the Party apparatus. The one man who stood between him and unchallenged supremacy was Vladimir Lenin, and since Lenin’s failing health obliged him to stay away from Moscow for increasingly longer stretches, Stalin’s hold over the Party grew steadily tighter. ….Stalin’s haste and his infatuation with pure administration, together with his spite against the notorious ‘nationalist-socialism’ (Stalin’s characterisation of the Georgian Communist leadership) played a fatal role here. In politics spite generally plays the basest of roles. Not content with this damning indictment, Lenin went on, in the same note, to refer to Stalin as “a vulgar Great- Russian bully’’ who ‘‘carelessly flings about accusations of ‘nationalist-socialism’ (whereas he himself is a real and true ‘‘nationalist-socialist’…)”. These notes were in fact dictated to a secretary by the sick Lenin who had already had his second stroke which had robbed him of his power to hold a pen in his hand. His disgust with Stalin and his way of functioning – and with the authoritarian tendencies inside the Party that Stalin so clearly represented — was not just palpable here; Lenin wanted the Party rank-and-file to know about this situation and about how the Party should never treat the question of nationalities except on strong egalitarian principles. Lenin desperately hoped that his intervention would stem the ideological rot that he feared was spreading across the Party apparatus. However, Stalin, the all-powerful Secretary-General, had by now placed the ailing Lenin under close surveillance. He had gathered up enough power in his hands to do practically what he wished. That is how Stalin managed to suppress this eloquent message from Lenin on the question of national minorities in a socialist federation. Not until Stalin died more than thirty years later that these notes, along with a few other we will look at presently, became known to the wider Soviet public. Meant to be kept secret till he himself, or in his absence, Nadezhda Krupskaya, his wife and comrade – disclosed their contents at the next Party Congress, these notes were yet discovered by Stalin through his own contacts in the Lenin household. So, even as the dying Lenin told himself that he had done his final duty by the Party by letting it know of his views of the Party leadership, Stalin resolved to bury these notes completely. Besides, he was infuriated by this turn of affairs. The historian Orlando Figes records (in his massive A People’s Tragedy: The Russian Revolution, 1891-1924) how Stalin called up Krupskaya after he got to know about the notes and threatened to initiate disciplinary proceedings against Krupskaya for ‘having failed to ensure that Lenin abided by his doctors’ advice’. Krupskaya was devastated. When Lenin got to hear about this fresh outrage in March, 1923, he shot off an angry missive to Stalin, demanding an unconditional apology. By now, Stalin was completely confident of his unquestioned hegemony over the Party hierarchy. He also knew that Lenin stood no chance of a comeback. So, he wrote back to Lenin in barely-concealed contempt, dismissing the dying man’s charges of misdemeanour. Lenin was shattered. A few days later, he suffered his third, most crushing attack of Sclerosis. There now was no hope whatever of even a distant recovery. Vladimir Lenin was as good as dead. Vladimir Ilyich lay there with a look of dismay, with a frightened expression on his face, his eyes sad with an inquiring look, tears streaming down his face. That photograph from the summer of 1923, showing Lenin with a stricken look on his face, was really the Revolution’s epitaph on Vladimir Lenin. One of the greatest revolutionaries in history lay crushed under the weight of a terrifying sense of guilt: he imagined he had driven the Russian Revolution into the wilderness.